A dynamic scorer in the ABA and NBA, Rick Barry is a Hall of Fame small forward that is best remembered for his time with the Golden State Warriors. The only player to claim the league scoring title in both the NBA, ABA and NCAA, Rick Barry card interest is limited, but he is well-respected in basketball circles and voted as one of the 50 Greatest Players in NBA history. Shop for Rick Barry Cards on eBay. Rick Barry first burst onto the scene at the University of Miami. After a terrific collegiate career, Barry was selected second overall in the 1965 NBA Draft by the San Francisco Warriors. Named NBA Rookie of the Year and a two-time All-Star during his early career, this was still not enough to keep Barry from jumping to the ABA. While the move ultimately cost him a season of play because of a reserve clause in his contract, Barry spent the next few years with the upstart league. His 30.46 points per game average over four seasons is the highest in ABA history and tops any other player in the history of professional basketball in the United States. Barry returned to the NBA and rejoined the Warriors. Now known as the Golden State Warriors, Barry led the team to the 1975 title and later finished his career out with the Houston Rockets. Upon his retirement in 1980, Rick Barry was an eight-time NBA All-Star, four-time ABA All-Star and the 1975 Finals MVP. He also won an ABA title with the Oakland Oaks in 1969. After his active playing career ended, Rick Barry started his second career as a broadcaster, working in the field for many years. He also has four sons that played professional basketball, notably Jon Barry and Brent Barry. While the first years of Barry's career did not include cards, collectors have several options from 1970s, including his official rookie card. Autographs and relic cards followed in the 1990s, and Rick Barry has been a regular signer in recent years, especially for Panini and Leaf products. Sporting an awesome old-school look, the 1971-72 Topps Rick Barry rookie card was issued well into his career. Perfectly capturing the era of basketball, ungraded versions of the Barry card regularly sell for $15-20, but high grades can push into the hundreds and PSA 9 copies have recently sold for around $600 (2015). 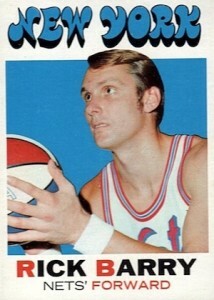 Also found in the 1971-72 Topps set, Rick Barry was featured on two different subset cards. 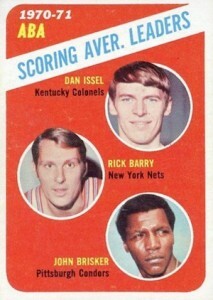 The first honored the 1970-71 ABA scoring average leaders and includes Dan Issel and John Brisker. 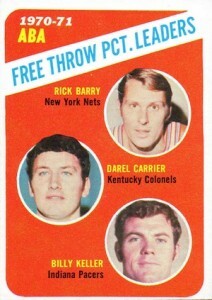 There is also similar card for the free throw percentage leaders that features Barry alongside Darel Carrier and Billy Keller. Both cards are great budget options with the scoring leaders card being slightly more popular.